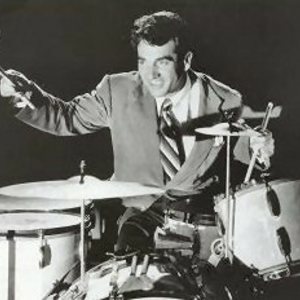 Gene Krupa (January 15, 1909 ? October 16, 1973) was a famous and influential American jazz and big band drummer, known for his highly energetic and flamboyant style. Many consider Krupa to be one of the most influential drummers of the 20th century, particularly regarding the development of the drum kit. Many jazz historians believe he made history in 1927 as the first kit drummer ever to record using a bass drum pedal. Krupa was born Eugene Bertram Krupa to Polish parents in Chicago, Illinois. He began playing professionally in the mid 1920s with bands in Wisconsin. He broke into the Chicago scene in 1927, when he was picked by MCA to become a member of "Thelma Terry and Her Playboys", the first notable American Jazz band (outside of all-girl bands) to be led by a female musician. The Playboys were the house band at The Golden Pumpkin nightclub in Chicago and also toured extensively throughout the eastern and central United States. Krupa made his first recordings in 1927, with a band under the leadership of banjoist Eddie Condon and "fixer" (and sometime singer, who did not appear on the records), Red McKenzie: along with other recordings beginning in 1924 by musicians known in the "Chicago" scene such as Bix Beiderbecke, these sides are examples of white "Chicago Style" jazz. The numbers recorded at that session were: 'China Boy', 'Sugar', 'Nobody's Sweetheart' and 'Liza'. The McKenzie - Condon sides are also notable for being the first records to feature a full drum kit. In 1929 he moved to New York City and worked with the band of Red Nichols. In 1934 he joined Benny Goodman's band, where his featured drum work ? especially on the hit "Sing, Sing, Sing" ? made him a national celebrity. In 1938, after a public fight with Goodman at the Earl Theater in Philadelphia, he left Goodman to launch his own band and had several hits with singer Anita O'Day and trumpeter Roy Eldridge. Krupa made a memorable cameo appearance in the 1941 film Ball of Fire, in which he and his band performed an extended version of the hit Drum Boogie.